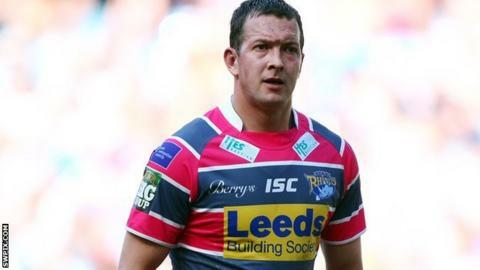 Leeds Rhinos half-back Danny McGuire does not believe the Challenge Cup final result will have any bearing on Saturday's Grand Final. The Rhinos face Warrington in a repeat of August's showpiece, which the Wire won 35-18. "For me the Challenge Cup is irrelevant, we just want to play well this week." he told BBC Radio Leeds. "It hurts that we lost that game but we haven't mentioned it and it's been forgotten about." McGuire missed the Wembley defeat by Tony Smith's side with a knee injury and was absent for Friday's hard-fought 13-12 semi-final win over Wigan through suspension. The England man, who became Super League's highest try scorer earlier in the campaign, is hopeful of earning a recall to the side. "It was difficult to watch on Friday, it was probably the most nervous I've ever been watching a game," he added. "I'm not sure if I'll play and it will be hard to drop someone from that 17 but I'd like to think I can slot back in. "I played in the previous two play-off games so hopefully I won't be left biting my nails again." If McGuire is restored to the side he will be playing in his seventh Grand Final in nine seasons. He believes the Rhinos' experiences will stand them in good stead against a Warrington side making their first appearance at Old Trafford. "Mentally we're able to handle the tough times and savour the good times because I think a lot of us remember what it feels like to win here," he concluded. "Last year we finished fifth and no one really gave us a chance to do it and I think if we do it again this year, having won in France and Wigan, it would be an even greater achievement. "We've got 80 minutes to write history again and that is something this team likes doing."